The Black-and-white Creeper appears in the State of Louisiana as soon as the buds on the trees begin to expand, which happens about the middle of February. It throws itself into the forests, where it breeds, and remains until the beginning of November. It is usually seen on the largest trees of our woods. It has a few notes, consisting of a series of rapidly enunciated tweets, the last greatly prolonged. It climbs and creeps along the trunks, the branches, and even the twigs of the trees, without intermission, and so seldom perches, that I do not remember ever having seen it in such a position. It lives principally on small ants and their larvae, which it secures as it ascends or descends in a spiral direction, sidewise, with the head either uppermost or beneath. It keeps its feet close together, and moves by successive short hops with a rapidity equalling even that of the Brown Creeper. It dives from the tops of the trees to their roots, and again ascends. At other times, it alights on a decayed fallen tree, and searches the bark for food, peeping into the crevices. It has only a very short flight, and moves directly from the tree it is on to the nearest. In this manner the Black-and-white Creeper reaches the Northern Districts. It always prefers the most uncultivated tracts, and is especially fond of the pines and hemlock-trees of the mountain-glens. I have met with it on the borders of Canada, round Lake Champlain, in the country far to the north-west, on the banks of the Illinois, in Ohio, Kentucky, and all the wooded districts of the Arkansas and Red river. In Louisiana, its nest is usually placed in some small hole in a tree, and is composed of mosses in a dry state, lined with cottony substances. The eggs are from five to seven, of a short oval form, white, with a few brownish-red spots chiefly at the large end. Two broods are raised in the season. The young go about in company, following the parents, and it is not unusual to see nine or ten of these birds scrambling with great activity along the trunk of a tree. I have not found its nest in the Middle States, where, however, I am convinced many breed. I found this species in the Texas, breeding near Buffalo Bayou, where I saw a young one that had fallen out of the nest, which was in the prong of a broken limb not more than ten feet from the ground. It breeds in localities greatly distant from each other, and, like many other birds, on this account, places its nest in different situations, and varies the materials of which it is composed. 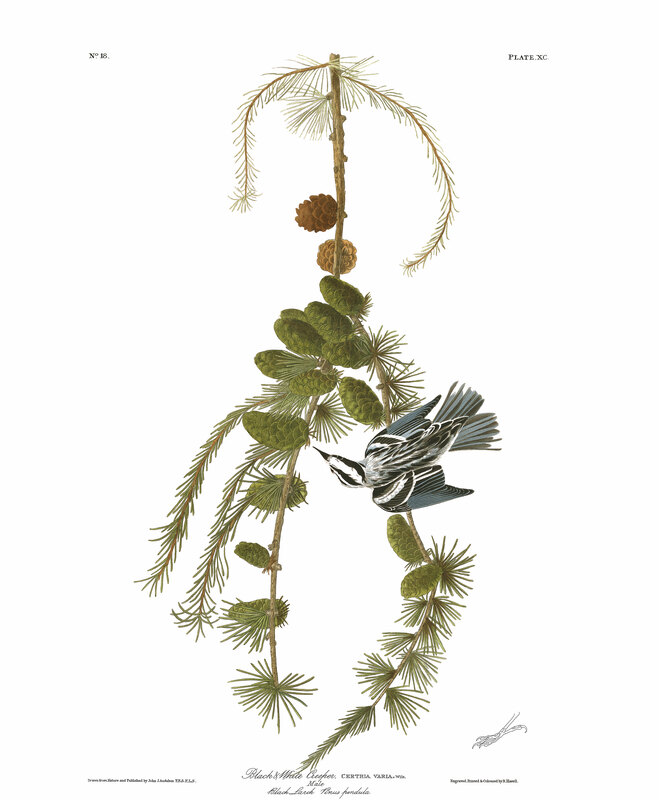 Mr. NUTTALL saw a nest in the vicinity of Boston, which was "niched in the shelving of a rock, on the surface of the ground, and was externally composed of coarse stripes of the inner bark of the hemlock-tree (Abies canadensis) which overshadowed the situation. With these were mixed soft dissected old leaves, and a few stalks of dead grass; the lining was made of a thin layer of black hair." The eggs of this bird measure four and a fourth eighths in length, and half an inch in breadth. Some of them are much more spotted with light reddish-brown and purplish dots than others. Of this latter kind I have a beautiful specimen presented by my friend Dr. T. M. BREWER of Boston. As some persons might suppose from my account of its habits, that it uses its tail to aid it in climbing, like the Brown Creeper, I must here state that it never does so, but hops in the manner of the Nuthatches. My friend Dr. BACHMAN has observed it in spring perched on small twigs and uttering its song composed of half a dozen notes, which are heard at a considerable distance. It arrives in South Carolina early in April, remains until about the 10th of May, and has been seen on its return as early as the 1st of September. Dr. T. M. BREWER sends me the following notice:--"This bird, which you speak of as breeding in the hollows of trees, with us always builds its nest on the ground. I say always, because I never knew it to lay anywhere else. I have by me a nest brought to me by Mr. APPLETON from Batternits, New York, which was found in the drain of the house in which he resided. It is neat and compact, measures 3 1/2 inches in external diameter, 2 1/2 in internal; its internal depth is 1 inch, the external two. It is composed externally of coarse hay, and lined in an unusually compact manner with horse-hair. The eggs are oval, nearly equal at both ends, and measure six-eighths of an inch by nine-sixteenths, and are in markings exactly as you describe them. The number in this nest was three, but their complement is, I believe, four." BLACK-AND-WHITE CREEPER, Certhia varia, Wils. Amer. Orn., vol. iii. p. 23. SYLVIA VARIA, Bonap. Syn., p. 81. BLACK-AND-WHITE CREEPER, Certhia varia, Aud. Orn. Biog., vol. i. p. 452;vol. v. p. 471. Bill rather long, slightly arched, compressed, extremely slender, acute; nostrils basal, narrow, half-closed by a membrane. General form slender. Feet of ordinary length, slender; tarsus longer than the middle toe, scutellate before; toes free, scutellate, the hind one proportionally larger; claws compressed, very acute, arched. Plumage soft and blended. Wings of ordinary length, third quill longest, secondaries short. Tail nearly even, of twelve narrow, rounded feathers. Bill black. Iris hazel. Feet dusky yellow. Middle of the head longitudinally white, bordered on each side by a broad stripe of black, beneath which, on each side, over the eye, is a line of white. Ear-coverts and chin black. Back and breast streaked with white and black. Wings black, the outer margins of the quills greyish-white, the tips of the larger coverts, excepting the primary ones, white, forming two broad bands of that colour across the wing. Tail black, tinged with bluish-grey externally, the ends of the inner webs of the three outer feathers on each side white. Abdomen white; sides and under tail-coverts white, spotted with black. Length 5 1/2 inches, extent of wings 7 1/2; bill along the ridge 1/2. The young are similar in colouring to the females. The young males do not acquire their full plumage until the following spring. A male of this species is represented on a twig of the tree commonly called the black larch. PINUS PENDULA, Pursch, Flor. Amer., vol. ii. p. 645.--MONOECIA POLYANDRIA, Linn.--CONIFERAE, Juss. Leaves fasciculate, deciduous; cones oblong, the margins of the scales inflected; bracteoles panduriform, with an attenuated tip. This species, which grows in cedar swamps, in the Northern States, attains a great size, and resembles the European larch in appearance. Membership benefits include one year of Audubon magazine and the latest on birds and their habitats. Your support helps secure a future for birds at risk. Our email newsletter shares the latest programs and initiatives. A $320,000 Donation Match Expires Soon! A $80,000 Donation Match Expires Soon!! Audubon is a nonprofit organization committed to protecting birds and the places they need. We rely on our members for support. You can help us by making a donation today. We're in a race against time — to give birds a fighting chance in a rapidly changing world. Your support will hellp secure the future for birds at risk from climate change, habitat loss, and other threats.